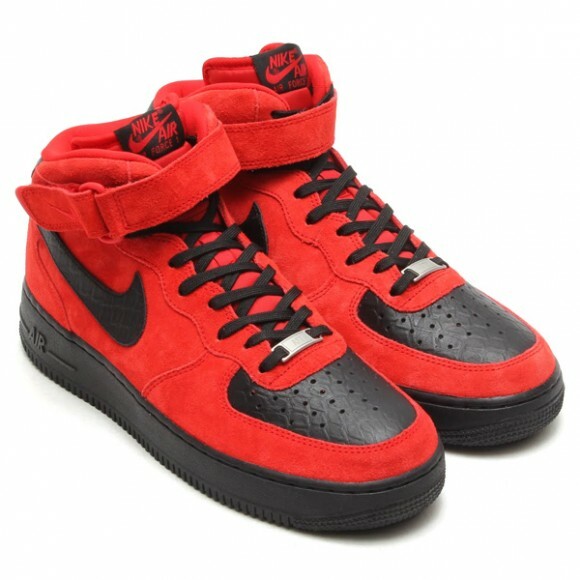 The Nike Air Force 1 Mid ‘Red Suede Python’ is a gorgeous colorway of a forgotten shoe. The red suede upper is contrasted with a faux black python leather toebox and swoosh giving it a custom vibe. The thin black laces and black outsole are great touches on this black and red pair. It turns out black and red are still a great combination. The Nike Air Force 1 Mid ‘Red Suede Python’ is available now overseas at retailers like atmos but should make its way to Nike Sportswear retailers in a few weeks. Thoughts on this latest AF1 colorway? Share them in the comments below.